Mercury Rev may still sound like themselves and only themselves, but that sound has now been sharpened to a very fine optimistic point -- and all points can still slice an edge. The last time we heard from Mercury Rev, they had simultaneously dropped two albums in our laps. The release of their 2008 album Snowflake Midnight was accompanied by an all-instrumental companion album called Strange Attractor. We should have taken the hint that these two albums were supposed to tide us over for a rather long time because Mercury Rev wouldn't emerge until seven years later with the self-recorded and self-produced The Light in You. Long gaps like this have steadily become the norm in pop music as well as the artist's reluctance to alter their style while they're away. Besides, a band like Mercury Rev already underwent a heavy musical shift when lead singer David Baker bailed on them back in 1993. At that moment, the band morphed from purveyors of angular racket to an American pop/shoegaze act constantly being compared to the Flaming Lips. It would be foolish to expect singer Jonathan Donahue and guitarist Sean Mackowiak, aka Grasshopper, the two main architects behind Mercury Rev's sound, to rip up their blueprints this late in the game. So depending on what kind of Mercury Rev fan you are, you may be well-served or disappointed to learn that the seven year absence hasn't changed their sound that much. But enough about what hasn't changed, let's move on to what The Light in You can offer us. Press material is cryptic on the subject, but the prolonged silence from Mercury Rev can apparently be blamed on personal and physical problems as well as Grasshopper's newfound fatherhood. The songs inside the album reflect these heavy themes, though their specific meaning is about as vague as the "calamities" that Donahue and Grasshopper experienced during their off hours. For instance, The Light in You's second song is one clearly intended to strike you in the gut... hard. "Amelie" isn't assembled from very many lyrics, but the words that are in place combine with a dramatic musical buildup with a degree of sincerity seldom heard in pop music nowadays: "Amelie, unlock the door / I'll break the habit / Unlock the door / I'll break the habit / I want no more." We don't know what this "habit" is, but it's clear that Donahue's character is hurting badly. And have you ever found yourself so distracted by a personal crisis that the only thing you have the focus for is a long walk in the dead of night? Another song, "Central Park East", has that angle covered. "Am I the only lonely boy to ever walk in Central Park?," the song's protagonist asks himself over and over again on the album's lengthiest track. Gentle guitars and softly-pulsing keyboards fill the air around Donahue's sensitive voice so naturally that the whole thing borders on turning you numb. They certainly do make up for it though. The ambiguously-named "Emotional Freefall" kicks the tempo up a notch while the surrounding ornamentation keeps it firmly entrenched in pop's fourth dimension. The side two triptych of "Autumn's in the Air", "Are You Ready? ", and "Sunflower" is a much appreciated shot in the collection's arm. The single "Are You Ready?" may seem like the obvious odd duck with it's suddenly-bursting My Bloody Valentine chorus, but "Sunflower" feels even more out of place. 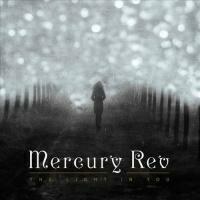 With a tempo faster than any songs before it, a horn chart that sounds like it was shipped from Memphis, and lyrics like "There's no point in feeling down", it really feels like Mercury Rev is getting in touch with their soulful side. "Moth Light" changes all of that, transplanting The Light in You back to the band's turn-of-the century territory. "Rainy Day Record", the album's final track, is an ode to pop music itself. If it feels a great deal more redemptive than that, there's a good reason in place. "The arc of the album, lyrically, is someone who's gone through an incredible period of turbulence, sadness and uncertainty," explains Donahue. "And as the album progresses, a light appears on the water." For "Rainy Day Record", Mercury Rev gives the listener a chance to bathe in said light. "For the first time in forever / I laid the needle down inside the groove / For the first time in forever / I hold my breath waiting for side two." When you hear these guys name-dropping Peter Hook and Dead Can Dance, you can safely bet that this is the most jubilant that Mercury Rev has ever sounded since the unfairly maligned The Secret Migration. But unlike The Secret Migration, the band sound like they have a clear path paved ahead of them on The Light in You. Mercury Rev may still sound like themselves and only themselves, but that sound has now been sharpened to a very fine optimistic point -- and all points can still slice an edge.